The tool detects whether a module’s edge pin is used for more than one interface at the same time. The tool detects whether a SoC function is used more than once. The tool detects whether a SoC pin is used more than once for different interfaces. 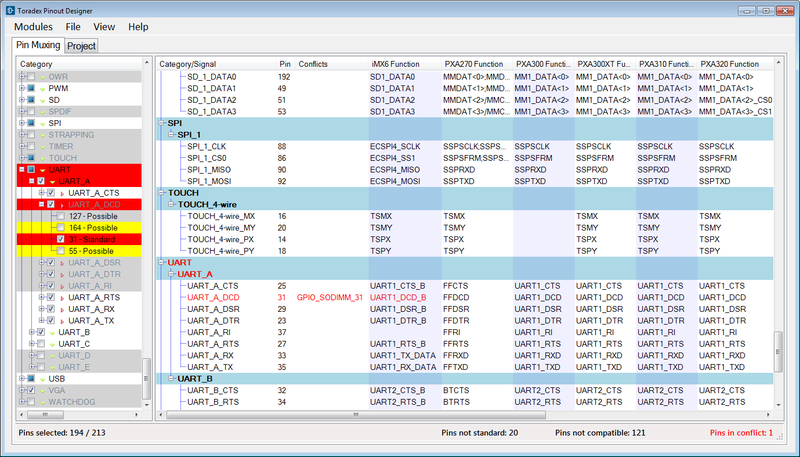 The Pinout Designer can be used for configuring the pin multiplexing of a single Toradex module. Multiple modules can be selected. Differences between the modules are highlighted. This allows creating a configuration which is compatible with different Toradex modules. The Pinout Designer is a powerful tool to check whether the pin muxing of an existing carrier board is compatible with new Toradex modules. The export function allows creating helpful function and pin-lists for the hardware and software development. Use always the latest version of the tool and the database. Always check for information to the interfaces in the datasheet of the corresponding module. The pin muxing database is carefully created and tested. However, Toradex does not guarantee that the data is correct. Toradex cannot be in anyway held responsible for faults that may be caused by inaccuracy of the database or the tool. Even though the tool shows the compatibility between two interfaces, beware that there could still be incompatibility in voltage levels, interface speeds, protocol, signal mapping, or any other specification. Even if an interface is available for a certain module, it is not guaranteed that Toradex will provide its drivers in the standard operating system image. Additional driver adoptions may be necessary or there might be no driver available currently. Whenever possible, it is recommended that you test the configuration on a suitable evaluation board. Toradex evaluation boards allow accessing major parts of the signals and using them for different purposes. The Colibri T20 has an additional pin muxing restriction which is currently not checked by this tool. The pins of the Nvidia T20 SoC are organized into groups. It is only possible to change the multiplexing of a complete group. Therefore, a manual check is needed. More information can be found in the datasheet. According to Nvidia’s recommendation for the Apalis T30 and Colibri T30, the different interface instances should not be mixed up within an interface. For example, it is not recommended to use UART1.E-RXD together with UART1.A-TXD. Either use all the signals from instance E or from A. More information about this can be found in the datasheet. If you have any doubts or questions, please do not hesitate to contact the Toradex support team. Note: The instructions provided are for reference only. They were validated on Ubuntu 18.04 LTS 64-bit. Install Wine either from the distribution repository or following instructions from Wine website. For instance, for Ubuntu access https://wiki.winehq.org/Ubuntu.